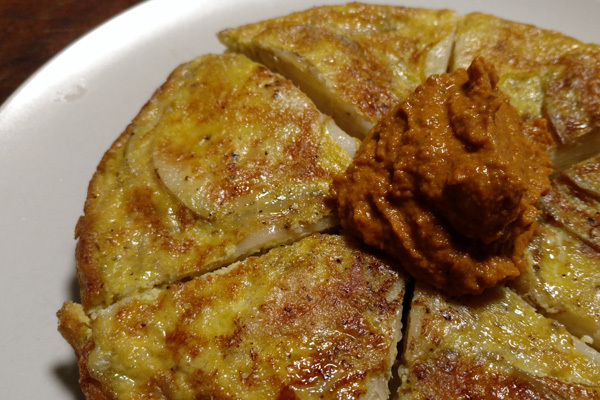 Spanish tortilla with romesco. No idea if that’s an authentic combo, but it sure was tasty! Peaches make an encore appearance. This could be the end, folks, as delicata squash enters the stage, signalling the oncoming fall. But even more exciting — the return of sweet potatoes! Also new this week but less fall-feeling: kiwiberries. I’ve never had them, but I do like kiwis! And also new this week, but not seasonally-related: Sour Cream and Buttermilk from Oasis at Bird-in-Hand. I know this is weird, but I’ve been drinking the buttermilk straight from the bottle because it’s that tasty. Like kefir, but thicker. In the “still here” category: habanadas, “Hatch” New Mexico green chiles, sweet corn, and, you know, lots of other things. Guys, I was going to write about the Spanish mini-feast we made for dinner last night, but Dusty just called Mom’s Tamales and Pupusas and they’re open RIGHT NOW. We’ve tried a couple times previously and found them inexplicably not open, so we’re gonna jump on this opportunity. Let me just say then, that romesco is one of the most delicious things I’ve ever eaten, and I don’t understand why it’s not more of a thing. Seriously. Make yourself some.